I recently read where Mark Bittman, who writes about food for the New York Times, gave away all of his cookbooks (perhaps he kept his own!). Although recipes are important to follow exactly for some food items, I really love cooking without a cookbook and also without always checking a recipe. 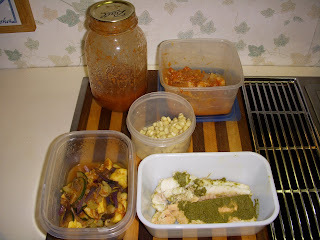 I prefer to just look around in my frig, freezer, and pantry to see what I have available and what I should use up. Soups, stews, sandwiches, salads, and stir-frys (hmmm, all "s" words, that's funny) are so easy to do this way. So in that spirit, last weekend I did just that to make Saturday Night Chowder, some of the best fish soup I think I have ever eaten, which is saying a lot since I always try to order fish stew or cioppino whenever I am in a coastal city like Seattle (where I first had cioppino many years ago), Boston, or San Francisco. I thawed the various broths then added the diced potatoes and cooked over medium heat until the potato pieces were almost tender before adding all the other ingredients except the frozen peas and chopped fresh kale. When the soup was heated through, I added the frozen peas and fresh kale and continued heating just until they were thawed and hot but still both were bright green. I added a teaspoon of spices Spice Merchant called Fish Broil, which contains dill, lemon grass, black pepper, garlic, in addition to some salt (not salt-free, which I would prefer, but at least what you see and taste are the herbs and spices instead of only salt as with some other seafood seasonings). This is just delicious and is a complete meal all by itself containing two hearty protein sources (seafood and beans), a healthy complex carbohydrate from the potatoes and peelings, so many vegetables that a big bowl is certainly going to contain at least 2 servings of a very wide variety, this is very low in total fat as none additional was added beyond what might have been contained in the thawed broths with the fat that is present being primarily the healthy omega-3 fatty acids from the fish, very low in sodium, high in fiber from the beans, potato peels, plus additional vegetables, most of the vegetables were organically grown with many being locally grown (onions, garlic, kale, potatoes, tomatoes). This dinner took almost no time at all to throw together. The most time consuming thing was the poking around the frig and freezer to see what was there, along with pulling all these little containers out on the counter. After that, thawing the broth, washing and chopping the potatoes (I do have a nifty gadget for doing that quickly) took only 10-15 minutes, with everything else simply tossed into the pan to heat through. It was great to get the refrig pared down to being able to see everything and know what is there to eat! How much chowder did this all make? I would say almost 4 quarts, enough for three very hearty meals for my husband and me plus one nice lunch portion for the two of us. I froze 1 quart to have for later fast food. There is a legend, true or not, that the word cioppino is derived from Italian cooks on the San Francisco wharfs asking local fishermen to "chip in" whatever they might have available for the local soup pot. Certainly that is how my chowder was created, a little of this, a little of that, making do with what I had available. However, I would say that the richness of flavor likely came from my habit of saving all broth for later use. So this creation was a combination of both planning and serendipity. I wonder how much of the richness of life follows that pattern of blending a plan for the future with awareness of what either needs to be done or is available right now. It certainly produced a memorable dinner that my husband and I truly enjoyed. Years and years ago now while I was recovering from my second breast cancer in 1995, I remember making the conscious choice to take my family off what I call the "fast food are us" track to instead take the time to cook for my family, to intentionally carve out that time from our busy life to go back to cooking for both my enjoyment and my healing. Of course, cooking a beautiful, delicious, healthy meal each day led to the next step, which was eating together daily as a family. By the time I was done with chemotherapy in 1995, my older son was off to college, so our family's daily ritual of eating together needed to be coordinated between only 3 people, while not easy to do, admittedly making it easier for my family than many others. Imagine my delighted surprise last night to read this grace, which perfectly expresses what cooking means to me. I have many favorite graces that I enjoy saying before eating. I'll be adding this one to that group. Your post is just what I try to encourage people to do, but not everyone is as thorough as you in saving bits. The other problem for me is that I have a limited sense of taste, so I don't have much idea of what I can put with what. I have bookmarked the post to explain the idea. Thanks.